Detail of Sanborn Map of Kerrville, November 1916. It all began with a curious notation on a Kerrville map. It ended with an accidental discovery of something in an old photograph. 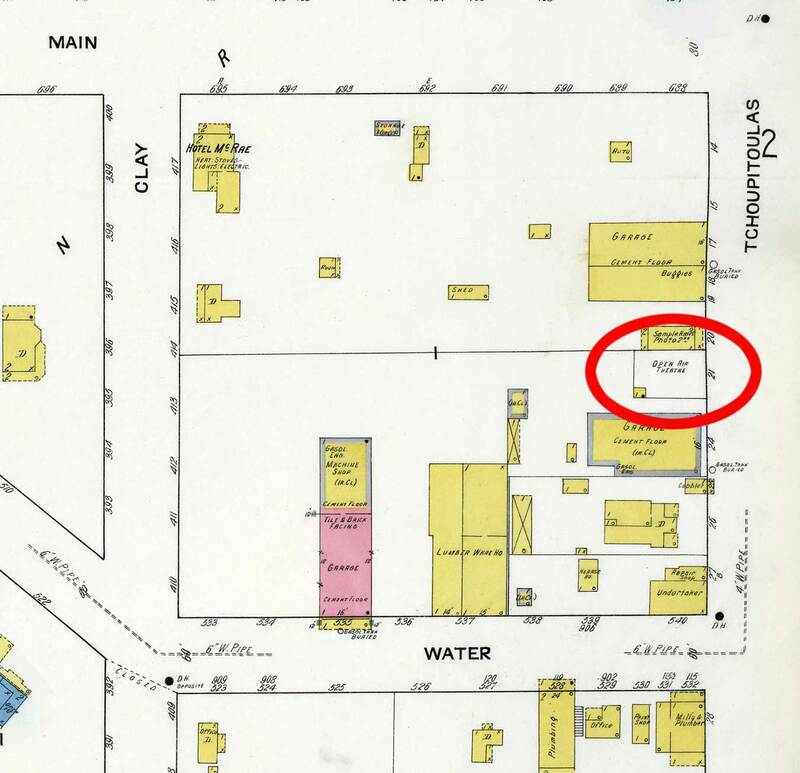 The November 1916 Sanborn map of downtown Kerrville shows an "Open Air Theatre" in the 200 block of what is now called Sidney Baker Street. Today a portion of the downtown parking building stands on the site. There is something charming about the idea of watching a movie under the stars, especially if you cancel thoughts of insects, poor weather, and the occasional rodent. Entertainments from outside our community were few in those days, and motion pictures were modern and new. I wanted to know more about the little theater shown on the map. It wasn't a big facility, basically a fenced area roughly 16 feet along Sidney Baker Street, stretching back about 25 feet. One small building stands in the corner. The "Open Air Theatre" doesn't show up on other Sanborn maps; I checked the 1904 and 1924 maps of that block, and the theater is not shown on either one. Years ago I found a description of the open-air theater in some of the writings of Anna Belle Council Roland. "About 1913," she wrote, "there was an airdome in the middle of the block on Sidney Baker, about where the hospital parking lot is now located. Admission was 5 cents." I always thought an outdoor movie theater made a lot of sense -- when the weather was pleasant. In those days, before air-conditioning, being inside a stuffy building to watch a movie would have been unpleasant for most of the year. I looked up "Airdome Theater" in old Kerrville newspapers, and found mentions in several issues. There was a problem, though. That "Airdome Theater" was on Water Street, and it operated in the mid-1920s, well after Mrs. Roland's account. I find several ads for the Water Street "Airdome Theater" in 1925 newspapers, including one which promised a "Wedding Gift of $20 in Gold" to the "first couple that will get married in our theater during the month of June." 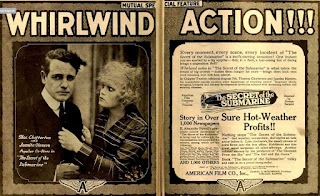 The newlyweds would also receive a 30 day movie pass, though I'm sure other entertainments might've occupied their attentions during their first month of marriage. 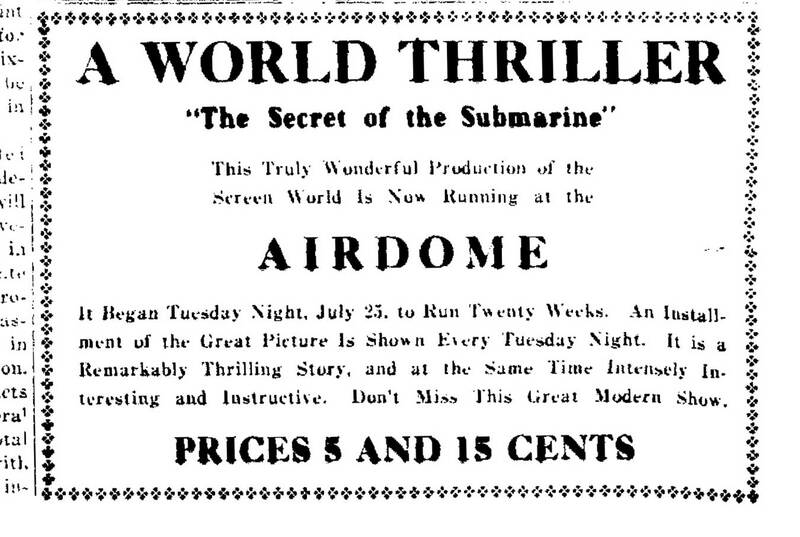 Despite this extraordinary offer, and others like it, the Water Street "Airdome Theater" did not last very long. 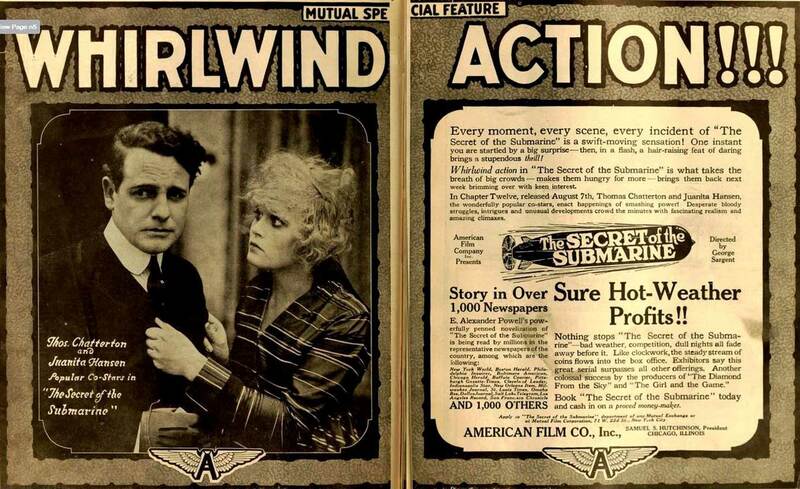 In July, the theater suffered a fire, caused by someone placing "copper coins in the fuse box after the fuses had been burned out, thus destroying the protection the fuse box is supposed to give the building." By November 1925 the Water Street "Airdome Theater" was being dismantled for its materials, "having been closed for months." I thought I'd found the Sidney Baker Street airdome when I found several references to the "People's Theater," but that turned out to be a group that rented Pampell's Opera House to show motion pictures and other entertainments during the time around World War I. Previously, Pampell had rented out his opera house to the "Gayety Theatre," which also showed movies. Pampell's Opera House, which was basically the upper floor of Pampell's, at the corner of Water and Sidney Baker streets, began showing movies on weekends in 1909, "with a complete change of program every night." Today the building is the home of the Humble Fork, a new restaurant. There is a brief mention of the "Airdome" in the August 12, 1916 edition of the Kerrville Mountain Sun. 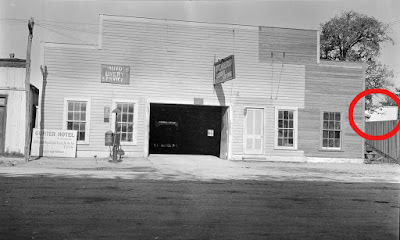 Of all of the various theaters mentioned, I believe this is the one shown on the 1916 map, and mentioned by Mrs. Roland. The story mentions moving pictures and "home talent of songs and music, the proceeds going for the benefit of the High School Library." 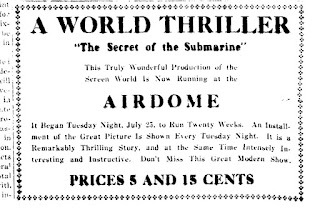 The Airdome showed serials, like the "Secret of the Submarine," which had 20 episodes, shown in installments every Tuesday night. The last mention of the Airdome was published in the summer of 1918, and noted admission included "war tax." of what is now Sidney Baker, the hint of a movie screen can be seen. By accident, I may have found a partial photograph of the old theater. In 1914 the Citizen's Auto Company stood on Sidney Baker Street, just to the left of the "Open Air Theatre." I have two photos of the old auto company, and I noticed something interesting in one of them. To the right of the auto company is a high fence, solid, so you can't peek through. And standing above the fence you can see the upper part of what appears to be a movie screen. Around a century ago, folks gathered in that little fenced area, and a flickering light projected stories onto a screen. Together they suspended disbelief. A few held hands. 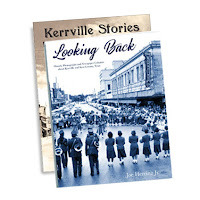 Joe Herring Jr. is a Kerrville native who watched movies with Ms. Carolyn at the Arcadia Theater in downtown Kerrville, years ago. This column originally appeared in the Kerrville Daily Times April 6, 2019.